I was fortunate enough to travel and rejoice whole of Jaipur “the ravishing muddy pink beauty”!the food I explored over there are really never to be forgotten with full dominance of ghee spread over a wide array of dishes.Ghevar available over there in a shop called “LMB” is a dessert that is haunting my mind till date and even brought home some loads of it and relished every bit!Unfortunately I missed out something important it was rawat’s famous “pyaz ki kachori”and “mava kachori” and no worry I could cover it next time when I visit but I can’t really guess when I will visit so till then Iam quite edgy to try it out at comfort of my home itself. 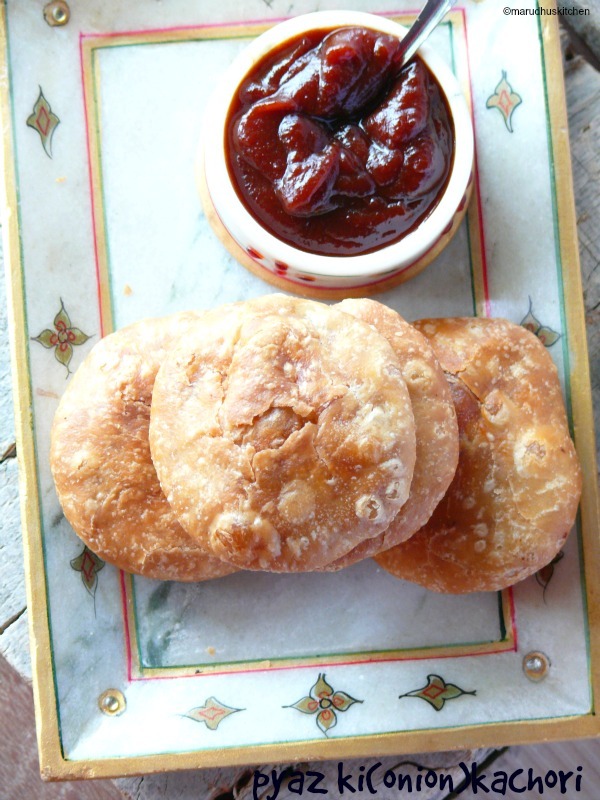 For these kachori’s the recipe says that even dips are not so needed! the hot and crisp kachori’s are hard to stop you will want more they are so mesmerizing with a hot cup of tea.I served it with tamarind and green chutney and it tasted super tasty with tamarind chutney than the green chutney.Its not so needed that you must prick the kachories with fork before frying to prevent it from puffing up and always for frying these kachories keep the flame low so that it is cooked through nicely and crisp.Add only ghee for mixing the dough not oil if you want the exact onion kachori as it would be and the taste what to say? is simply adorable.The size of the kachories can be made according to ones own need can be made smaller or bigger.Come lets explore the enchanting taste of pyaz ki kachori. 1.Take maida in a vessel add salt and melted ghee mix nicely like crumbs. 2.Then add needed water to make a soft pliable dough and let it rest for 15- 20 minutes. 3..After readying all the things Keep a kadai add oil to it when it heats up add kalonji,cumin and coriander-saunf mix. 4.when every thing roasts well add chopped ginger garlic and chillies and mix well. 5.Then add onions with needed salt. 6.Saute well for sometime till it changes colour. 7.Then add chilli powder saute well. 8.Add mashed potatoes mix well. 9.Add besan and mix nicely for sometime. 10.Switch off add chopped coriander and mix well,let it cool. 11.Make balls out of the dough. 12.Take one ball roll and keep filling and close it and pinch off the extra that comes at the top. 13.Again press flat with the hand or roller, in-between heat oil. 14.Fry kachori’s at medium flame so that it becomes golden and cooks through nicely. 15.Take out in a tissue. 16.Serve with tamarind chutney or green chutney. Take maida in a vessel add salt and melted ghee mix nicely like crumbs. Then add needed water to make a soft pliable dough and let it rest for 15- 20 minutes. After readying all the things Keep a kadai add oil to it when it heats up add kalonji,cumin and coriander-saunf mix. when every thing roasts well add chopped ginger garlic and chillies and mix well. Then add onions with needed salt. Saute well for sometime till it changes colour. Then add chilli powder saute well. Add mashed potatoes mix well. Add besan and mix nicely for sometime. Switch off add chopped coriander mix well,let it cool. Take one ball roll and keep filling and close it and pinch off the extra that comes at the top. Again press flat with the hand in-between heat oil. Fry kachori's at medium flame so that it becomes golden and cooks through nicely. Take out in a tissue. While making kachori's you can prick the dough with fork before dropping it into the oil so that it does not puff up. I have not pricked as I liked it to be puffed. while making the stuffing you can add sugar to it will be a great combination of mixed flavours. You can rest the dough even for 30 minutes. Always cook in medium flame not high. After closing the kachori's with stuffing you can either roll with a rolling pin or press simply with hands to make it flat. When adding ghee to make dough it can be little warm. For seasoning also you can very well use ghee instead of oil. Adding besan is optional its only for binding purpose. Adding black cumin is also optional. They look so inviting ! perfectly shaped and so crisp…A must try indeed! 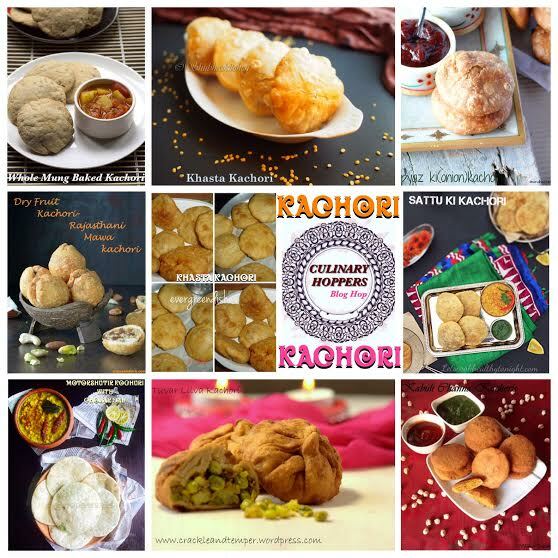 Never tried kachoris at home..Your clicks are making me drool over these beauties. yummy and filling kachoris!! Looks super tempting!! I am going to try this kachori soon.. as always brilliantly photographed…TOO GOOD!! 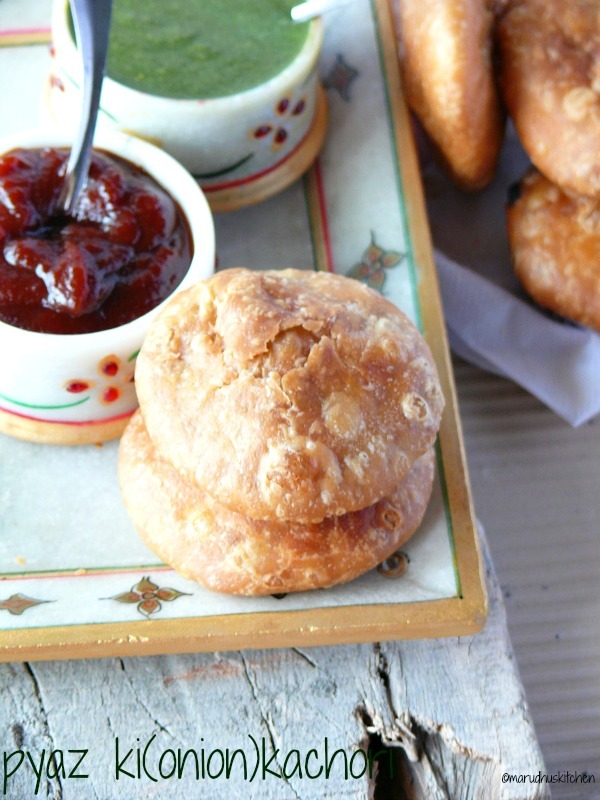 This is one of my favourite kachoris dear….you have got them so perfect…Drooling!! Sattu Ki Kachori | LET'S COOK HEALTHY TONIGHT! ah sooo wonderfully made kachoris Vani. fell in love with them the moment I laid my eyes on them. supeb dear! Awesome is the first word that comes to my mind. I can imagine how delicious these must have tasted. Looks just too good. You always come with lovely recipes, outstanding pictures and well explained posts, making your Blog one of my favourite.